Each tooth in your mouth consists of a portion below and above the gum line. The part below the gum is the root and the portion that is visible above the gum is the crown. No surprise then that the tooth restoration designed to repair an extensively decayed or damaged tooth is called a dental crown. Made of all-porcelain or all-ceramic materials, a crown fits snuggly over your tooth in order to maintain the shape and restore its function. And without the metal that crowns were formerly made of, you won’t have the telltale dark line along your gum to indicate that you have a crown. Your porcelain or ceramic dental crown will blend seamlessly with the color and sheen of your other teeth. A dental crown gets its name because it literally “crowns” or caps the entire visible portion of your tooth. When one of your teeth is damaged, cracked, chipped, or seriously decayed, we can use a dental crown to restore it back to its full function, size, strength, and beauty. Dental crowns are typically used to restore teeth or dental implants, but they can also be used as an aesthetic tool to fix misshapen or permanently discolored teeth. Dental crowns can be made of many different materials, but we use high-quality, all-ceramic materials to give you a beautiful and healthy smile for years to come. To get a traditional dental crown in Meriden, you’ll need to schedule two appointments at Meriden Dental Group that are spaced a couple of weeks apart. At the first visit, your dentist will anesthetize the tooth and surrounding tissue so you won’t feel any discomfort during the procedure. Then, your dentist will carefully remove a portion of your tooth’s natural structure along the sides and the biting surface. Decay and debris will also be removed. Reshaping the tooth is necessary in order to ensure the proper fit of your crown; it should not crowd adjacent teeth or feel too high when you bite. After reshaping your tooth, we’ll take an impression that will be sent to the dental lab where your permanent crown will be hand crafted. In the meantime, a temporary crown will be seated on your tooth. 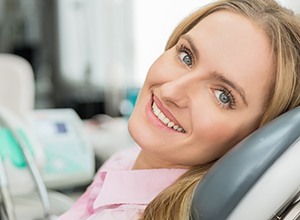 When the permanent crown is ready, you’ll return to your family dentist in Meriden where we’ll remove the temporary and cement your final dental crown in place. With proper care that includes daily brushing and flossing, regular checkups and not biting down on hard objects, your crown could potentially last a lifetime. Do you have a tooth that needs a bit of help? A dental crown could easily repair it so you can smile and chew with ease once again, so be sure to contact our office today for an appointment.